If you somehow missed the fact that Rick Grimes's journey on The Walking Dead was about to end, this will definitely clear that up for you. AMC dropped the trailer for the fifth episode of season nine, which will only ever be referred to as "Rick Grimes's Last Episode." The previous episode set the death of our favorite cowboy in motion, ending with him impaled by a rebar with two hordes of walkers closing in. So it's not looking good for ol' Rick. 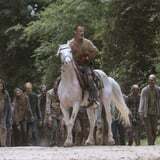 The trailer for episode five promises an intense and emotional trip, with what looks like Rick attempting to herd the walker hordes back to Georgia, away from the currently established communities. While we can only speculate about what this episode will bring, we do know that it will feature the return of Shane Walsh (Jon Bernthal). From the looks of it, Shane will be back as one of a few hallucinatory visits Rick has as he bleeds out. I imagine the former friends have a lot to talk about since Shane's death in season two, so it'll definitely be interesting to see how the two interact. There's also a brief clip of Michonne telling Rick, "It's not over. We don't die." Unless she knows something we don't, he's probably going to prove her wrong. It looks like the episode will mainly focus on Rick looking back on his journey as it ends and holding on just long enough to save his family from the giant walker horde. This episode will finally give us an answer to what happens to Rick Grimes and we'll probably never recover from it, to be quite honest. Check out the trailer above!